The season is right around the corner. The anticipation is building alright. Just as the baseball fan can’t wait for opening day and the excitement of that first pitch in the crisp spring air, those who follow politics with a passion will soon start watching their mailboxes, anticipating the first “pitch,” coming in the form of a polished mail piece that touts the benefits of one candidate or another. The best ones stand out. 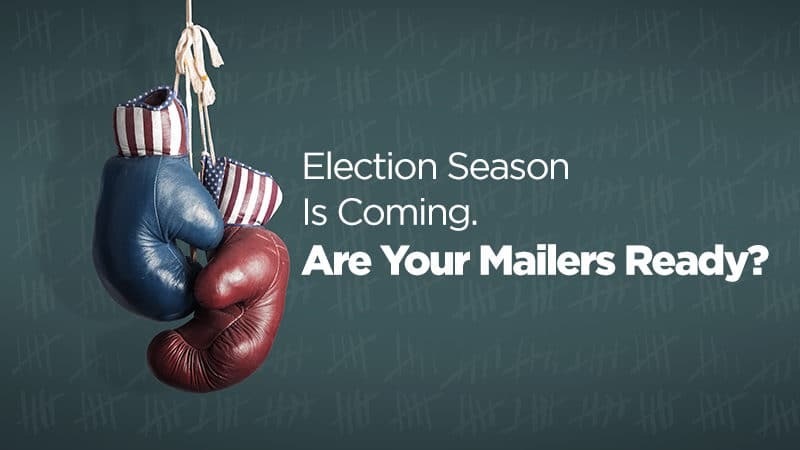 Over the next few months, we at Mellady Direct Marketing will be working with various political campaigns and candidates, helping them make sure their mail pieces are the ones voters remember most. • Size. Yes, in political mailings, size matters. Simply put, oversized mail pieces stand out and get noticed. • Quality Photography. Let’s face it, every candidate needs to show his or her best side. The same applies for issue-driven campaigns. The right images, telling the right story, can make the message more impactful. • Professional Design and Copy. If your mailpiece looks like something that might have been thrown together with construction paper and glue for the sixth-grade student council election, it won’t reflect as well on your campaign as well as a professionally designed piece with well-crafted copy. Your direct mail pieces are a key component of your political campaign, particularly in local races where network television advertising is not a factor. Direct mail is a cost-effective way to target a specific audience, and it plays an integral role in elections for everything from seats in Congress to state legislatures, city councils, school boards, judges and dog catchers. In 2012, 2.8 billion political mailpieces were sent via the U.S. Postal Service, at an average postage cost of less than 19 cents per piece. The Postal Service reports that 78 percent of mail recipients read or scan mail every day, and 40 percent of 18- to 34-year-olds read mail immediately and find it useful. Fast forward to 2018, and similar results are expected this political season. But we’ve made advances, too: Now, experienced direct mail marketers like Mellady Direct are crafting direct mail campaigns with a “social match” component to tie directly in to social media campaigns, ensuring that the target audience is reached wherever they are, whenever they are consuming information. Running for office? Working on a political campaign? See how Mellady Direct Marketing can help move your campaign strategy forward with direct mail and social match marketing. Call us today at (661) 298-9190 or contact us online at www.melladydirect.com.